Racing game thrills meet platformer charm in MotoHeroz, a side-scrolling racer built with simple controls and engaging physics. The result is a new kind of racing adventure! Players race, chase and rally their way through a brightly coloured world, competing against their friends for the fastest times, entering daily races, and hunting for secrets and coins. Ghost race against the Leader Boards, join a Buddy League, and compete online in daily competitions. 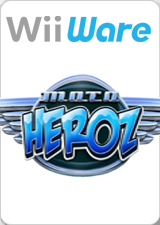 It’s MotoHeroz, for WiiWare. This game has heavy graphical glitches with D3D, but works fine with OpenGL and Vulkan. Glitches are visible on the title screen after clicking through the first few static screens. The graph below charts the compatibility with MotoHeroz since Dolphin's 2.0 release, listing revisions only where a compatibility change occurred. This page was last edited on 13 February 2019, at 08:56.